How Fracking Is Fueling A Power Shift From Coal To Gas Driven by new regulations and fracking, more coal power plants are retiring for cheaper, cleaner-burning natural gas. But scientists have yet to work out the fossil fuel's imperfect climate footprint. 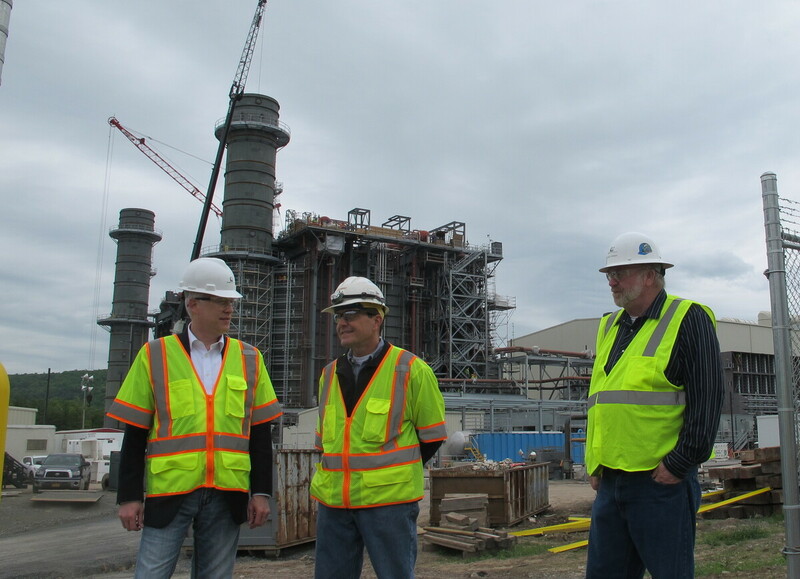 Bill Pentak of Panda Power Funds (left), Plant Manager John Martin (center) and Construction Manager Rob Risher (right) stand in front of the construction site for the new Panda Liberty gas power plant in Towanda, Penn. The plant, expected to come online in early 2016, was deliberately sited on top of the Marcellus Shale to take advantage of the cheap, abundant gas. "This plant was sited precisely where it is because of its access to the abundant, high-quality natural gas that's found a mile to two miles beneath our feet," he says. He's referring to the Marcellus Shale underfoot. In recent years, this part of north-central Pennsylvania has become home to one of the most productive gas fields in the world. Pentak works for Panda Power Funds, a Dallas, Texas-based company that has two more gas plants planned for Pennsylvania. The projects are part of a bigger story. "What's taking place here is taking place across the United States," Pentak says. It's a trend Gary Helm is watching. He studies emerging markets for the PJM Interconnection, the regional grid organization for the Mid-Atlantic and Midwest. It's sort of like an air-traffic controller for the power system that helps keep the lights on for 61 million people. "We see, down the road, definitely a lot of gas coming online," he says. That's because the rise in fracking freed up a lot more, cheap gas. Up until the mid-2000s about half the electricity in the U.S. was produced by burning coal, while 20 percent or less came from gas. Tyler Hodge, an analyst with the Energy Information Administration, says these days, coal has dropped to about 40 percent of the nation's power, and gas now accounts for nearly a third. "Definitely the Mid-Atlantic and Pennsylvania regions especially are showing some significant shifts towards natural gas," he says. Coal plants are also retiring as the Obama administration pushes its climate change action plan, which would require the country to cut carbon emissions by 30 percent from 2005 levels, by the year 2030. Back at the construction site, Bill Pentak stands next to the plant's generator and points out that gas has an advantage in all this: As more renewables come online, gas plants can ramp up and down quickly. So when the sun isn't shining, or the wind isn't blowing, he says gas can fill in the gaps. "You have to have something that can be quickly dispatched to make up for that lost power, or it threatens the reliability of the grid," he says. That's not to say using more gas doesn't pose some problems. Although gas produces about half the carbon emissions that coal does when you burn it, there is still uncertainty within the scientific community about its overall climate impact. Christina Simeone of the Kleinman Center for Energy Policy at the University of Pennsylvania says drilling and transporting gas leads to the leakage of methane, a potent greenhouse gas. "When you look at gas production, you look at coal production, you know, these are imperfect resources that do have impacts," she says, "just like all these resources are imperfect and they all have impacts." The Energy Information Administration is projecting that gas power generation will become increasingly common under the Obama administration's climate plan. The agency expects the regulations would cause more coal plants to shut down. And gas will begin to take its place, followed by more renewable energy.